The institutions in Paraguay offering Mandarin Chinese courses jointly presented an end of year assembly in the auditorium of the University of the Integration of the Americas, on November 24, 2018. The eight institutions that currently offer Mandarin Chinese courses are: the Diplomatic Academy, the Language Center of the Ministry of Defense, the Language Center of the Armed Forces Command, the Vocational Training Center of the National Republican Association – Colorado Party, the National University of Asuncion, UNIDA University, the National Service of Professional Promotion, and Chiang Kai Shek School. 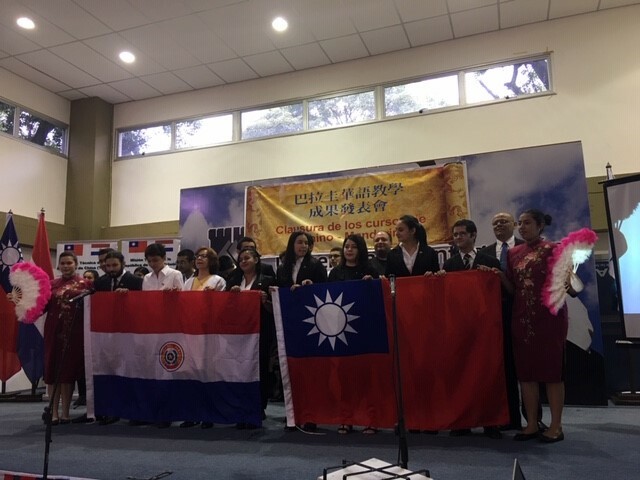 The cheerful occasion was presided over by Mr. Fernando Ding, Counselor at the Embassy of the Republic of China (Taiwan) to the Republic of Paraguay, and attended by authorities from different local institutions, teachers, students, and students’ families and friends. Three of the teachers – Jeff Cheng, Cristina Chao, and Cecilia Lin – are sponsored by the Republic of China (Taiwan) through the Ministry of Education and the International Cooperation and Development Fund, to teach Chinese as a foreign language in Paraguay. The students gave presentations, including speeches, videos, songs and theatrical performances in Mandarin, demonstrating what they have learned this year. Counselor Ding warmly congratulated the students for their achievements and pointed out that learning Chinese is a very important tool for their future careers.